Hardscape is any inanimate part of your outdoor space. This includes retaining and sitting walls, pavers, steps, decks, and other parts of your outdoor landscape that aren’t alive. Unlike lighting living parts of your landscape such as flower beds, bushes, lawns, and trees, installing hardscape lighting often means drilling into hard materials. But despite the added challenge, hardscape lighting is crucial for any outdoor lighting scheme. Familiarizing yourself with the hardscape lighting basics will help you start to imagine how you can improve your outdoor living spaces. Hardscapes are some of the most critical areas of your landscape. They are also some of the most neglected when it comes to lighting. Many outdoor lighting experts are quick to install decorative lighting that highlights trees, bushes, and flowerbeds. They use path lighting, uplighting, moonlighting, and well lights, all to beautiful effect. But some lighting designers may shy away from hardscape lighting because of the extra work and technical skill required. But if you leave out hardscape lighting, you are doing only half the job. 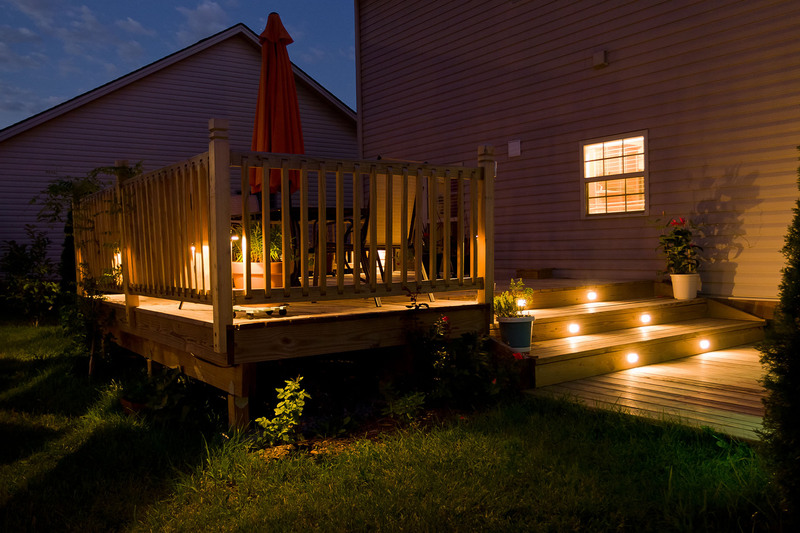 Some of the most common hardscape lighting is the lighting for your patio or deck. Even the simplest home usually have some sort of lighting for their patio or deck. It’s not always pretty, often just a single bright light, but it’s at least something. Another prevalent hardscape light is the porch light or entrance light on most homes. Professional lighting design and installation can create a much, much better lighting scheme, but as a bare-bones setup, most homes have at least a patio and an entrance light. But what can you really do with hardscape lighting? The possibilities are endless. Good hardscape lighting doesn’t just give you a light to find the front door, it creates new shapes and interesting contrasts using light and shadow and the shapes and textures of your hardscape. It improves the safety of your home by preventing slip and falls as well as deterring unwanted guests. It also makes outdoor spaces livable, comfortable, and relaxing, increasing the total living space of your home. Hardscape lighting can be a challenge. One of the biggest issues is technical. If your outdoor spaces and hardscaping were not designed to include lighting, it can be technically difficult to install it. There are some tricks we use to hide light fixtures so that all you see is the light. But in many instances, it requires drilling or otherwise working your way into concrete, rock, stone, and other hard materials. However, when it’s done right, it is well worth the effort. There are many areas that you would want to make more livable at night by adding hardscape lighting. One popular hardscape feature that absolutely requires lighting is an outdoor kitchen. Fire features, outdoor fireplaces, and fire pits also need additional lighting to be really usable, despite having fire as a significant source of light. If you have a pool, the area around your pool needs adequate lighting both for beauty and safety. While many people don’t think of this as hardscape lighting, driveways and paved paths also need lighting to be safer and more useful at night. If you are designing an outdoor kitchen, you have to keep lighting in mind. What good would an outdoor kitchen be if it got dark as soon as the sun went down? When lighting an outdoor kitchen, you need to consider all of its uses. At times you will need bright light to cook by. But at other times you will want more subdued lighting to eat and relax by. There are different ways to achieve this. One of the simplest approaches is to use dimmable lights that can be turned to full brightness for cooking then toned down for relaxing. But there are some other neat tricks, too. For instance, the use of down lighting hidden under the lip of stonework bars, walls, and benches. When the brighter main lights are turned off, these lights can stand out to provide extra light to see by and to show off the texture of the stonework, without being overpowering. Similar hidden lighting can be installed under soffits, in pergolas, and elsewhere to create a warm glow that washes over your seating area without any imposing fixtures. It may come as a surprise, but outdoor fireplaces, fire pits, and other fire features really to need extra lighting. If you’ve ever sat around a campfire at night, you are familiar with the harsh contrast of looking into a bright fire with deep darkness all around you. While that may be appealing for a camping trip, it’s usually not what you want in an outdoor living area. If you’re going to set up some comfy outdoor chairs and couches for a luxurious seating area focused on a central fire feature, you need to be able to see your way around. Similar to the feel of a kitchen when it is being used to eat, the lighting around a fire feature should be subtle. The fire needs to stand out. So the primary goal of the hardscape lighting should be to avoid harsh shadows. It should also spread out the light beyond the area right around the fire. A common trick is to hide lighting fixtures underneath the lip of a wall or other feature and shine the light against the wall. Another approach is to use well lighting that is recessed into the stone, brick, or concrete floor. The light can be aimed at vertical features, like the edge of a tall fireplace, or the pillars of a pergola or other outdoor structure. They can also be kept relatively dim, to avoid glare, and used to just spread a soft glow along the ground. Well lights can provide a surprising amount of light without being overwhelming. Pool lighting can be a huge upgrade to your pool. Lighting the area around your pool tastefully and artfully can take your pool to the next level, creating a resort-like atmosphere. If you have a water feature, like a waterfall fountain, it may even be possible to incorporate some colored lights. In general, it is best to be very judicious with colored lighting. Too much colored light can make your upscale garden look like a children’s miniature golf course. But one situation where colored light can work is when it is paired with water. For a water feature or fountain, a little colored light can create an interesting glow that attracts the eye. Of course, a major concern with lighting a pool area is safety. First, you need enough light to avoid falls, either from obstacles or just wet feet on slippery deck surfaces. But you also want to make sure that you are not making matters worse by installing lighting fixtures that can become obstacles themselves. This is one area where well lighting can be a great solution. By setting the lights into the ground, you eliminate the risk of tripping on a lighting fixture. You can also provide enough light on the ground to avoid missteps that could lead to injury. When it comes to good hardscape lighting, you want to make sure that you are working with a company that is experienced. It is essential for your outdoor lighting installers to know how to design an effective hardscape lighting system, which is different than standard landscape lighting. Installing lighting into an existing hardscape can also require skilled craftsmanship, so picking an experienced installer is crucial for good results. Night Vision Outdoor Lighting has installed over 5,000 projects for businesses and homeowners around the Atlanta metro area. We know our way around a hardscape. So if you are ready to learn more about lighting your hardscape, contact us today for a free consultation.